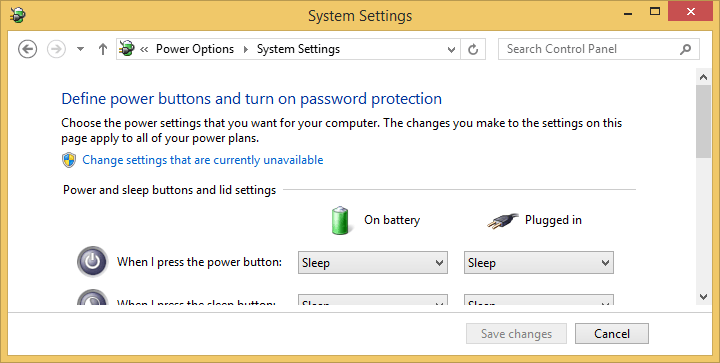 In Windows 8, Windows 8.1, Windows 10 or later Windows OS, there are three built-in power options (or power buttons) which are enabled and available in Power menu by default. 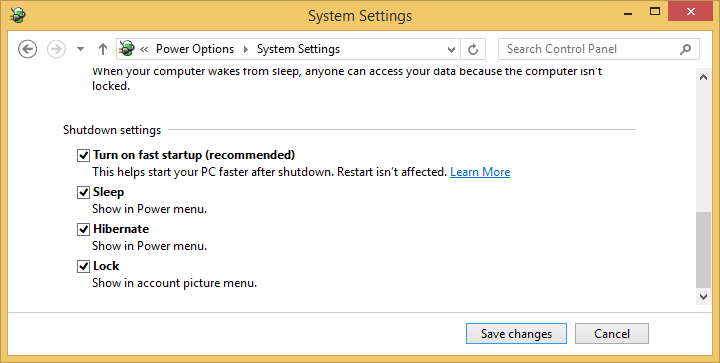 They are Sleep, Shutdown and Restart, which represents three out of many methods where a Windows PC can be shutdown. 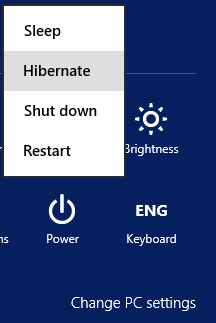 One glaringly missing way to shutdown the computer from the Power menu is through hibernation. Hibernate a computer allows a computer to preserve working state with all the open apps and files and not consuming any power after shutting down as Windows will dump the content of the memory to disk before completely powering off the computer. When restarting from hibernation state, the computer quickly resume and back to the last working state where the computer was left off. Open “Power Options” by searching for Power Options in Search box of Charms bar (hit Win + S or Win + W (search Settings only) keys to open it or hit Start button in Windows 10). In Power Options, select Choose what the power buttons do. In System Settings, click or tap the blue text Change settings that are currently unavailable. Scroll down “Shutdown settings” section, and tick the check box for Hibernate. You can now access to and select “Hibernate” in Power Menu of Windows 8, Windows 8.1, Windows 10, Window Server 2012, Windows Server 2016 or later. Don’t like Hibernate in Power Menu? Here’s how to remove and hide the Hibernate in Power menu.